Some use-cases require IdP to provide different MFA authentication mechanism depending on SAML SP app such as HOTP Email for SP1 and HOTP SMS for SP2. One option is to implement this via a custom authentication node. This custom authentication decision node allows MFA selection based on spEntityId. This node retrieves spEntityId from referer URL string and return outcome mapped to given choice.If spEntityId is not found or matched, then it returns "Other" outcome. Some use-cases require IdP to provide different MFA authentication mechanism depending on SAML SP app such as HOTP Email for SP1 and HOTP SMS for SP2. One way to implement this is via SAML's AuthnContextClassRef where specific AM chain/tree can be mapped to required Context ref but this requires SAML SP to provide this info in SAML request. Not all SAML SPs can provide this info and this also means SAML SP has control over authentication mechanism at IdP side. Other option is to implement this via a custom authentication node. This custom authentication decision node allows MFA selection based on spEntityId. This node retrieves spEntityId from referer URL string and return outcome mapped to given choice. If spEntityId is not found or matched, then it returns "Other" outcome. AM has been installed and configured. Maven has been installed and configured. The code in this repository has binary dependencies that live in the ForgeRock maven repository. Maven can be configured to authenticate to this repository by following the following ForgeRock Knowledge Base Article. Build custom authentication node by running "mvn clean install" in the directory containing the pom.xml. Restart the web container to pick up the new node. The node will then appear in the authentication trees components palette. Add required choices for this node like available SP entity IDs. 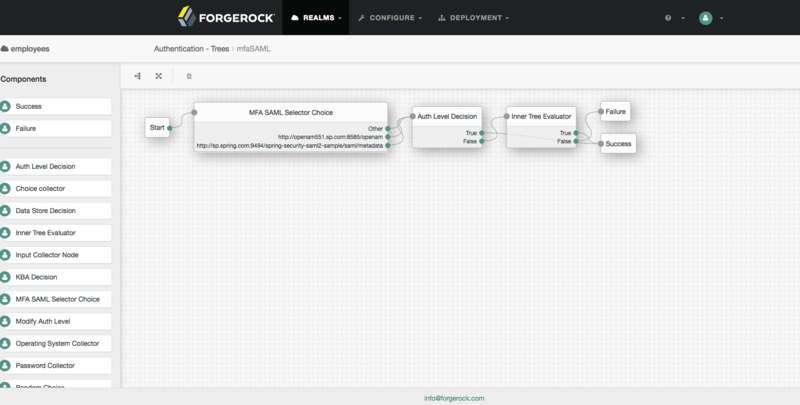 Add required outcomes for "MFA SAML Selector Choice" node like HOTP SMS, HOTP Email etc and link appropriate authentication nodes for these outcomes.